I picked up a bottle of Deschutes Red Chair NWPA on a trip through Spokane, Washington, intrigued by the nice label art, and by the brewery’s claim to have created the first Northwest Pale Ale. I’ve never had a Deschutes beer I didn’t like, and the neck ring copy–offering a plush, satiny experience featuring “edges out, layers in”–sounded promising. Tired of in-your-face, over-the-top hop madness, I decided to check it out. I was not disappointed. Eager to join the NWPA trend, I figured the skiing metaphor suggested a beer that turns agreeably, with a smooth ride featuring layers of citrus, tropical fruit and a malty finish. The label mentioned seven European and North American malts. ABV was 6.2%: assertive, but not the alcoholic blast of some of the runinators. The Deschutes website now offers a recipe for a Red Chair clone, though it is very light on details. There’s only six malts mentioned, and the hops are Centennial and Challenger, not my idea of tropically fruity additions. Last fall I made up my own recipe, and I believe I came up with a version that nicely represents Northwest Pale Ale. I started with Briess DME plus some Belgian extra dark aroma sugar and dark candi sugar. 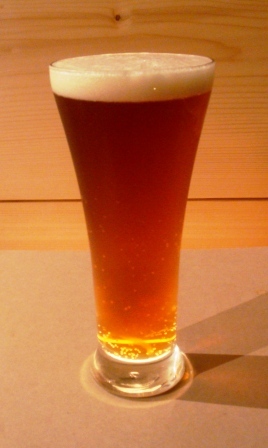 I steeped six kinds of crystal malt together with touches of chocolate wheat, cara-aroma, cara-pils and melanoidin malt to put a hint of redness in the color. As I was brewing in early September, I had a chance to try out another West Coast innovation: wet hopping. I used freshly-harvested homegrown Nugget, Willamette and Fuggle hops, added continuously during a one-hour boil. I pitched White Labs’ WLP 090 San Diego Superyeast for this one, because of its clean flavor profile and relatively high attenuation. I wanted an emphasis on malt and hop aromas and flavors, not yeastiness. The beer started at 13 Plato. After six days I racked the beer into a carboy and added 6 grams of sea salt. Ten weeks later I added 14 grams of Citra pellets to the carboy, and let it rest for a month and a half. Finishing at 1.25 Plato this is a dry beer with nice overtones of malt and grapefruit. It pours a golden amber with hints of red. A modestly creamy head drops after a few minutes, leaving lacy patterns on the glass. The aroma is dominated by grapefruit to my nose, with a suggestion of passionfruit. Moderate body, a fruit burst on the palate without a full-on hop assault, and a malty finish. I had one after skiing yesterday–well worth the six-month wait! This entry was posted in Uncategorized and tagged ale, barley malt, beer, fermentation, homebrewing, northwest pale ale, pale ale recipe, umami.